"Surviving: The Body of Evidence," an interactive exhibition that explores the process of evolution and its profound impact on humans, opened in 2008 at the University of Pennsylvania Museum of Archaeology and Anthropology in Philadelphia, and is currently on a multi-city, national tour. The innovative exhibition, three years in the planning, was made possible in large part by a nearly $2 million grant from the National Science Foundation, with additional support from individual, corporate and foundation donors. 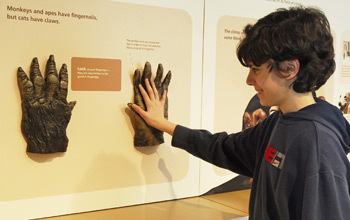 The exhibit gives visitors the opportunity to engage in a variety of multimedia programs, as well as view and touch more than 100 casts of fossil bones from the primate and human evolutionary records, in a rich exploration of physical anthropology and its relationship to evolutionary science. Interactive activities throughout the exhibition enhance a focused examination of the human body in the context of its evolutionary strengths and limitations, while large-screen technologies help give life to complex topics. The exhibit is at the Pink Palace Museum in Memphis, Tenn., through Sept. 18, 2010, with additional site locations to be announced. Visit the "Surviving: The Body of Evidence" website: http://www.penn.museum/sites/surviving/.